President Vladimir Putin says Moscow is halting its participation in the Cold War-era INF nuclear agreement after Washington’s decision to suspend it. Russia will develop missiles previously forbidden under its terms. “Ours will be a mirror response. 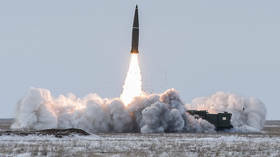 Our US partners say that they are ceasing their participation in the treaty, and we are doing the same,” the Russian president said in Moscow on Saturday in reference to the Intermediate-Range Nuclear Forces Treaty (INF). “They say that they are doing research and testing [on new weapons] and we will do the same thing,” Putin said during a meeting with Foreign Minister Sergei Lavrov and Defense Minister Sergei Shoigu. Yet, he maintained that if Russia gets short and mid-range missiles, it won’t deploy them in Europe unless Washington does it first. While offers on modernizing the 1987 treaty and making it more transparent “are still on the table,” no more talks should be initiated with the Americans to try and save it, Putin said. In December, the Trump administration threatened to quit the agreement, which limits nuclear and conventional land-launched missiles with a range between 500 and 5,500km within 60 days, unless Russia stopped allegedly violating it with its 9M729 missile, which Washington claims exceeds the permitted range. Moscow denied that it had broken the treaty, and offered additional mutual inspections during failed talks in Geneva last month. On February 1, Washington officially confirmed that the bilateral agreement signed by Mikhail Gorbachev and Ronald Reagan will be suspended for 180 days. The White House also signaled intentions to entirely withdraw from it afterwards. During the meeting in front on the cameras on Saturday, Lavrov insisted that Moscow “attempted to do everything we could to rescue the treaty.” This included “unprecedented steps going far beyond our obligations,” he said, accusing Washington of systematically undermining the INF Treaty at least since the late 1990s. In particular, Washington started “testing drones that matched the characteristics” of ground-based cruise missiles banned in the treaty. “This is a direct a violation of the INF,” Putin interjected. 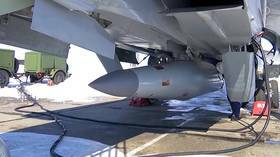 “Such launchers have already been completed in Romania, more are scheduled to be put into service in Poland and Japan,” Lavrov said. To put it simply, the US has already begun producing these rockets. Putin said the collapse of the INF is not a one-off, but marks a deliberate policy by Washington that could imperil the landmark New START treaty, which expires in 2021. “Over many years, we have repeatedly suggested staging new disarmament talks, on all types of weapons. Over the last few years, we have seen our initiatives not supported. On the contrary, pretexts are constantly sought to demolish the existing system of international security,” President Putin said.